Movement has always fascinated me. I have always enjoyed watching and participating in activities that involve movement. Relocating to Portland and parking my car only increased this enjoyment. Whether it's walking home in the rain, or paddling on the river, I love the time I spend outdoors everyday. I feel extremely lucky that I have found a profession that allows me to make it easier for people everywhere to fall in love with motion. Kim Voros has worked in diverse communities from Washington to New York assisting people transform their communities into locations where walking and cycling are regular and normal activities. Her professional work is focused in GIS-based modeling, infrastructure planning, network development, and implementation. Kim brings an array of skills in GIS, research, technical writing, policy analysis, and data analysis. 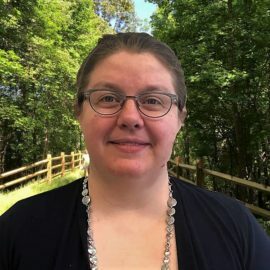 Whether she is walking home in the rain or biking around Portland in the sun, Kim values the exercise, social experience, and joy of active transportation.